In order to develop vocational education, a Memorandum of Cooperation was signed between the Ministry of Education and Science of Georgia, Liberty Bank and 12 education institutions carrying out vocational programs. Following the decision of Tamar Sanikidze, Minister of Education and Science of Georgia, those entrants who were able to pass minimum competency level in National Unified Examinations 2013 but were not enrolled in selected higher education institutions, will be eligible for secondary enrollments. August 26-31, 2013, GIZ is conducting training with the support of the Ministry of Education and Science of Georgia, Teachers Professional Development Center and Vocational College “Spektri”. The topic of the training is vocational pedagogy and didactics. 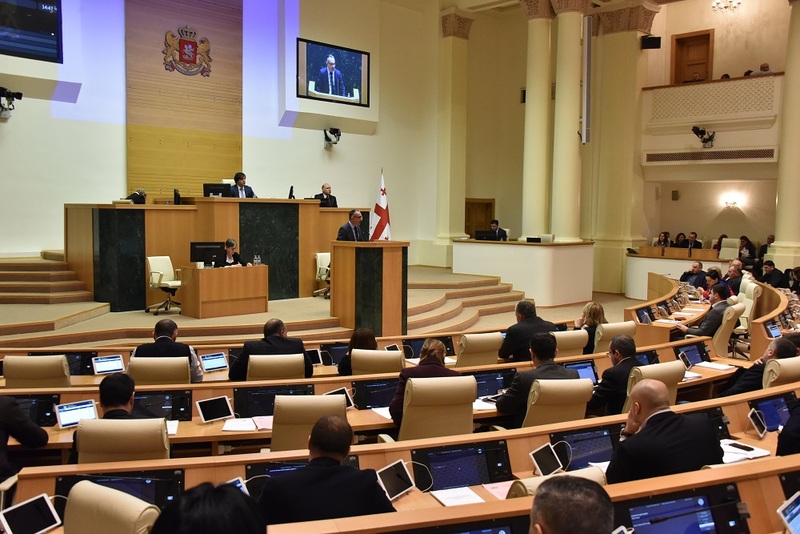 A work meeting of Special Committee reviewing cases of persons dismissed on political grounds was held in Batumi on August 24-25. The Committee members are planning to meet the authors of written applications submitted from Adjara and Guria and hold hearings of the witnesses. Before the beginning of new school year, all first grade head teachers will pass training on the topic of a special net-book for first graders - “Buki”. Minister of Education and Science of Georgia Tamar Sanikidze and Director of Teachers Professional Development Center Gia Mamulashvili familiarized themselves with the course of training. New rule for enrollment of applicants on vocational education programs has been elaborated by Vocational Education Development Department of the Ministry of Education and Science of Georgia. Training of personnel participating in registration process is under way starting from August 16 to August 23. Professor Niklaus Largier of University of California, Berkley is visiting Georgia with the invitation of the Ministry of Education and Science of Georgia. Professor Largier has conducted a three-day seminar on the topic of University arrangement in order to share international experience in this regard. The Ministry of Education and Science of Georgia has started the process of certification of school principals. Testing shall be held on August 21-22. Please see the schedule for testing. Boo-Keun Yoon, President of the company Samsung, Tamar Sanikidze, Minister of Education and Science of Georgia, Giorgi Kvirikashvili, Minister of Economy and Acting Rector of Ivane Javakhishvili Tbilisi State University Alexandre Kvitashvili opened a smart school class at Tbilisi State University. Today, Tamar Sanikidze, Minister of Education and Science of Georgia visited a public school in village Sasireti, Kaspi in order to get familiar with the rehabilitation works. Today, Tamar Sanikidze, Minister of Education and Science of Georgia awarded winners of School Subjects Olympiads with money prizes and diplomas. For the first time this year, up to 80 teachers of winning pupils were awarded with diplomas of appreciation. Ten best pupils from Georgian schools shall travel to Switzerland for 5 days to visit CERN Central Laboratory. They were selected from 70 pupils participating in “International Science Summer School”. The Ministry of Education and Science of Georgia organized a conference with the support of JSC “Liberty Bank” on involvement of private sector in vocational education. 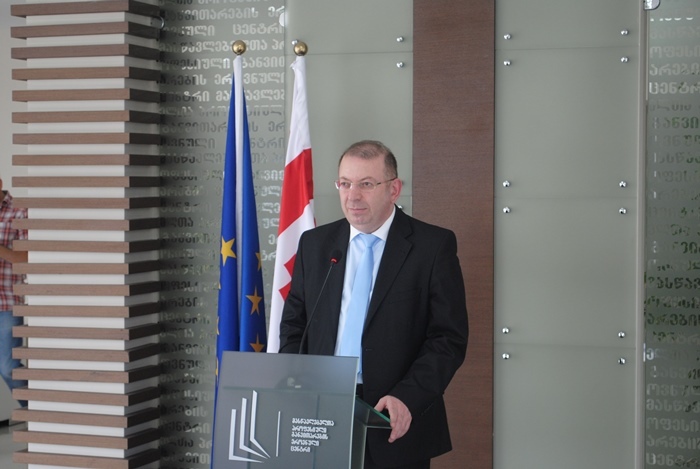 The conference was opened by Minister Tamar Sanikidze. Another work meeting of Special Committee reviewing cases of dismissal for political reasons was held in Kutaisi. Imereti is one of the first regions where Committee members shall meet with the applicants, hear testimony of witnesses and hold substantial review of the cases. National Curriculum Department of the Ministry of Education and Science was implementing a project “Sport for pupils with special educational needs” with the financial support of UNICEF. Professor Tassilo Schmitt from the University of Bremen visited Georgia with the invitation of the Ministry of Education and Science of Georgia. Foreign expert conducted a seminar on the issues of University management in order to share international experience. Today, Tamar Sanikidze, Minister of Education and Science of Georgia held a meeting with Daniel Yohannes, MCC CEO, Lea Henley, MCC Deputy Head of Administration and Richard Norland, US Ambassador to Georgia. Today, Minister of Education and Science of Georgia Tamar Sanikidze and Maura J. Foulton, Country Director of Peace Corps Georgia signed a renewed Memorandum of Cooperation. The Ministry of Education and Science of Georgia is starting a certification process of public school principals. This is the first stage of school principals’ contest. Today, Minister of Education and Science Tamar Sanikidze held a meeting with the students financed by the Ministry of Education in order to accomplish their studies in leading higher education institutions of the world. Today, the Ministry of Education and Science of Georgia and International Organization for Migration arranged a conference “Vocational Education Development – Vocational Education Strategy, Professional Orientation and Quality Improvement”. Minister of Education and Science of Georgia Giorgi Margvelashvili introduced new Minister Tamar Sanikidze to the public. Minister of Education and Science of Georgia Giorgi Margvelashvili introduced new Minister Tamar Sanikidze to the public. Today, Minister of Education and Science of Georgia Giorgi Margvealshvili and Giorgi Sigua, Head of Georgian National Tourism Administration signed a Memorandum of Cooperation. Minister of Education and Science of Georgia Giorgi Margvelashvili opened the second meeting of Leaders Forum of International Movement of Humane Pedagogy. 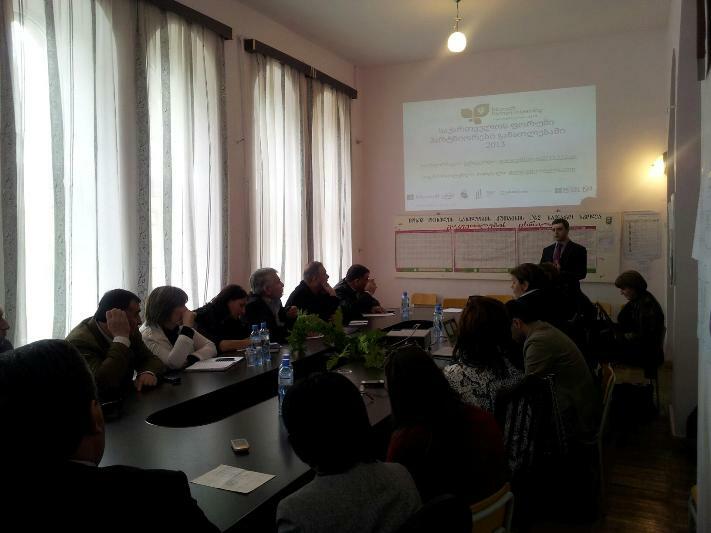 The meeting was arranged by Academician Shalva Amonashvili in village Busheti, Telavi. Press conference was held in Ilia Abuladze Exhibition Hall of National Center of Manuscripts. The Conference was dedicated to inclusion of 94 manuscripts preserved in the Center in UNESCO world international documentary register –“Memory of the World”. 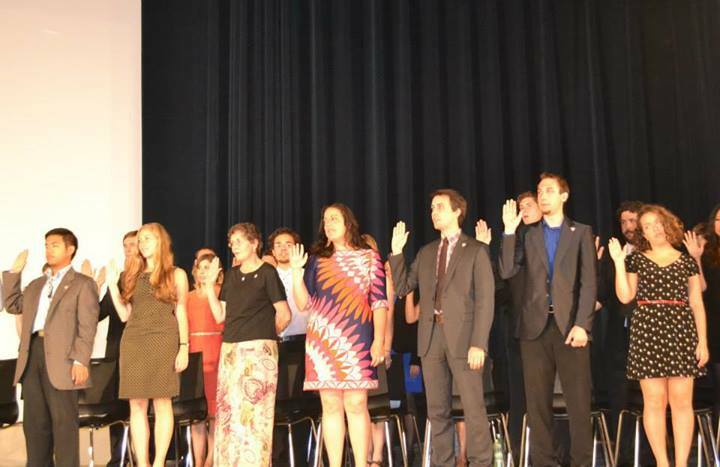 Oath Ceremony of the 13th Peace Corps Volunteers group was held in Ivane Javakhishvili Tbilisi State University. The group consists of 19 English language teachers and 11 volunteers of organizational development program. A presentation was held at the Ministry of Education and Science of Georgia on the world trends of the development of export oriented programming and innovations in IT sector. 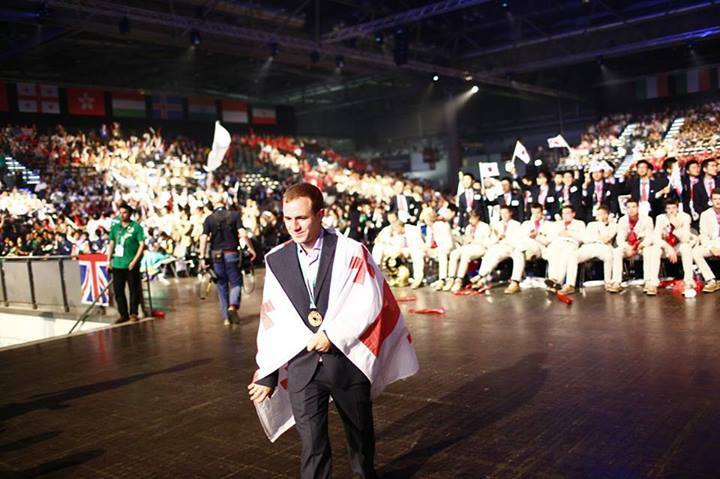 42nd WorldSkills International Competition held in Leipzig has ended. 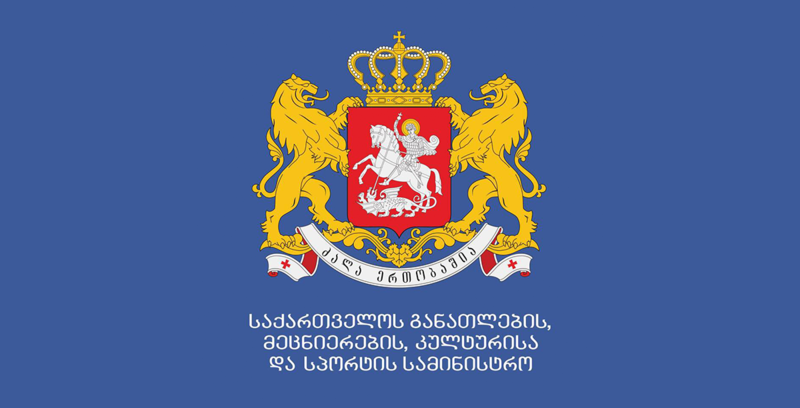 Georgia participated with the status of associate member for the first time. Georgian team was presented by 3 contestants: Ucha Ghviniashvili a web-designer, Evgeni Morozov a welder and Tinatin Iordanishvili a cook. A work meeting of the Special Committee reviewing cases of persons dismissed on political grounds was held on July 11, 2013. The meeting was dedicated to substantial review of applications; the Committee held hearing of witnesses and worked on project-decisions of already reviewed matters. Results of the contest for the position of Head of Resource Center announced by the Ministry of Education and Science of Georgia are known. Minimum competency level defined by the Committee is 60 points. Tea Sadzaglishvili, a teacher of Khidistavi Public School, Gori Municipality, was awarded with “Amagdari”, a pectoral award by Minister of Education and Science of Georgia. First Deputy Minister of Education and Science Tamar Sanikidze and Deputy Minister of Energy Ilia Eloshvili attended presentation-exhibition of best business energy projects presented by the Science Summer School. Special Committee reviewing cases of persons employed in Education System of Georgia and dismissed on political grounds held another work meeting at the Ministry of Education and Science of Georgia. National Curriculum Department of the Ministry of Education and Science of Georgia, with the financial support of UNICEF, starts implementation of a new project “Second chance of education for socially unprotected pupils, those with behavioral problems and pupils left beyond learning process in Georgia”. Testing phase for the position of Head of Resource Center announced by the Ministry of Education and Science of Georgia will be held on the 10th of July, 2013 at Education Management Information System (EMIS) building (address: 1a Panjikidze str.) according to the following schedule. With the initiative of Independent Experts Club of Georgia, Minister of Education and Science Giorgi Margvealshvili held a meeting with representatives of the Club. 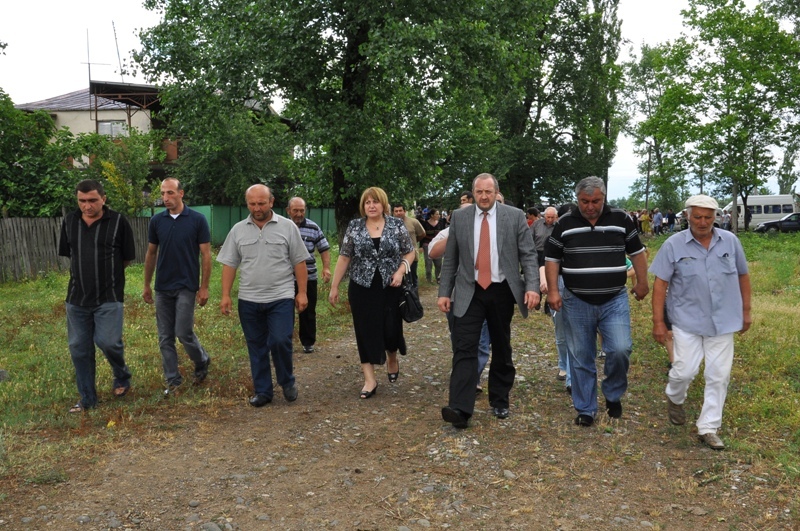 Today, Minister of Education and Science of Georgia Giorgi Margvelashvili met teachers, pupils and residents of the village Samghereti, in Tetrtitskaro regarding the issue of building of a new school in the village. After the increase in teacher salary, school management and administrative-technical personnel of all public schools shall receive increased salaries beginning from September 2013. First Deputy Minister of Education and Science of Georgia Tamar Sanikidze observed registration process in the examination center at Kutaisi Akaki Tsereteli State University. Today, Minister of Education and Science of Georgia Giorgi Margvelashvili observed university entrants’ registration process for Unified National Exams at Georgian Technical University. The winners of WorldSkills Georgia Competition, students of Georgian Vocational Colleges will participate in International Vocational Skills Competition held in Leipzig, July 2-7, 2013. Process of gradual distribution of textbooks in schools is under way. Today, Minister of Education and Science of Georgia Giorgi Margvelashvili visited №53 Tbilisi Public School and observed the process of textbook distribution. Within the framework of the project “Georgian Government for Open Governance”, Giorgi Margvelashvili, Minister of Education and Science of Georgia,” held a meeting with journalists. Today, Minister of Education and Science of Georgia Giorgi Margvelashvili held a meeting with the group of Tbilisi Ivane Javakhishvili State University professors and students who have expressed their desire to meet Minister Margvealshvili regarding the issues of planned changes in the field of higher education. With the invitation of American Chamber of Commerce and Business Association of Georgia (BAG), Millennium Challenge Georgia Foundation presented MCC second compact to BAG. The aim of the presentation was to show the progress achieved in the direction of preparatory stage of the Compact. Minister of Education and Science of Georgia opened a new physiological center based in the Office of Resource Officers of Educational Institutions in Kutaisi. Psychological center of the Office of Resource Officers is composed of psychologists, child psychiatrists and social workers. Vice Premier, Minister of Education and Science of Georgia Giorgi Margvelashvili on behalf of Prime Minister Bidzina Ivanishvili handed over a walking stick of the great poet to Akaki Museum. Today Minister of Education and Science of Georgia Giorgi Margvelashvili had a meeting with teachers of Batumi public schools. Minister introduced the novelties that have been implemented in the field of General Education recently. Minister of Education and Science of Georgia Giorgi Margvelashvili, Metropolitan of Senaki and Chkhorotsku Shio (Mujiri) and businessman Levan Vasadze visited Senaki St. Aleksi Shushania Orthodox School-Gymnasium. Deputy Minister of Education and Science of Georgia Aluda Goglichidze and Head of the Center of Civil Integration and Inter-ethnic Relations Shalva Tabatadze awarded 40 Armenian and Azerbaijani teachers with certificates. Today, Minister of Education and Science of Georgia Giorgi Margvealshvili and Minister of Education, Culture and Sport of Ajara Giorgi Tavamaishvili held a meeting with the students and teachers of Kobuleti Vocational College “New Wave”. 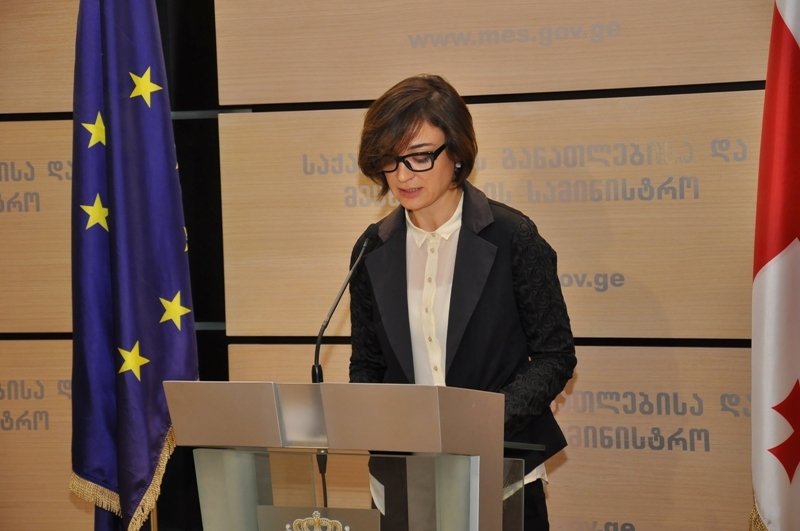 First Deputy Minister of Education and Science Tamar Sanikidze held a briefing on extern examinations. Today, Minister of Education and Science Giorgi Margvelashvili handed pectoral award “Amagdari” to Vazha Esartia, physics teacher of Zugdidi Merab Kostava Public School №2. Construction of a new school shall start in village Sadguri Sviri, Zestaponi District. Today, Minister of Education and Science of Georgia Giorgi Margvelashvili and Zestaponi Majoritarian MP Gogi Kavtaradze visited Sviri and the site where the new school will be constructed. Kumisi School in Gardabani has been named after Zurab Begiashvili. After graduating from Tbilisi State Medical University, lieutenant Begiashvili served as a doctor in 42nd battalion of infantry brigade of Georgian Armed Forces. Declaration on Autonomy and Principles of Academic Freedom of Universities of the Ministry of Education and Science of Georgia is available for public review. Today, Minister of Education and Science of Georgia Giorgi Margvelashvili had a meeting with residents of village Akhali Dioknisi in Marneuli. 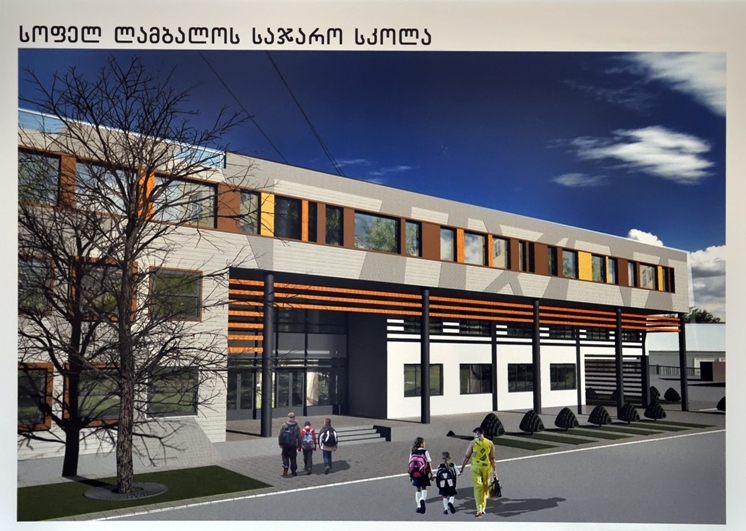 Minister introduced the decision of the Ministry regarding the construction of a new school. 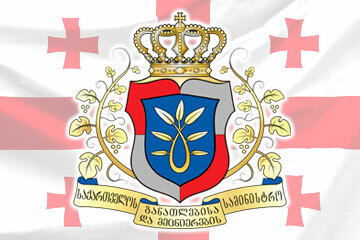 The Ministry of Education and Science of Georgia announces registration for extern examinations from June 17 to June 21, 2013. A memorandum was signed between Telavi Iakob Gogebashvili State University and Telavi banking sector. Ceremony of signing was attended by Minister of Education and Science of Georgia Giorgi Margvelashvili. Conference “Mood Theory-implementation and development” dedicated to 70 year Anniversary of Dimitri Uznadze Psychology Institute was organized at the Ministry of Education and Science of Georgia. Presentation of international jubilee almanac (licensed magazine) was also held. 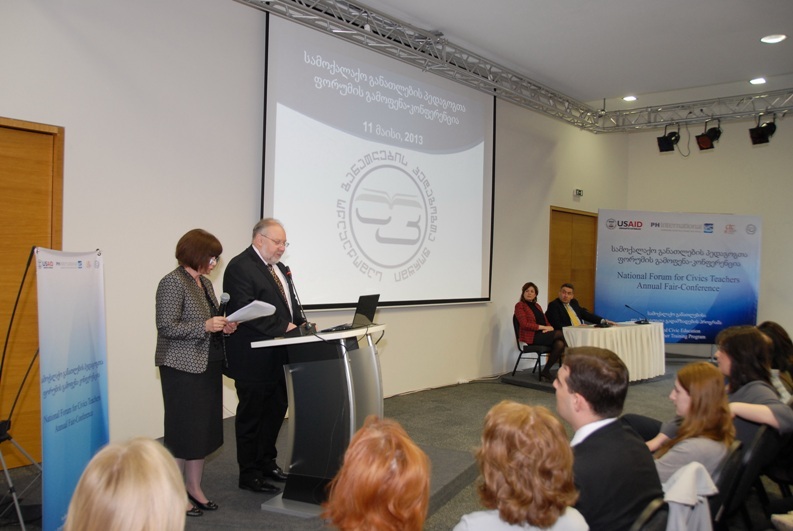 Minister of Education and Science of Georgia Giorgi Margvelashvili and President of Educators and Scientists Free Trade Union of Georgia, Mrs. Maia Kobakhidze introduced news on teachers` leaves to 80 Tbilisi school principals at the meeting organized in №24 public school. Fourth-grader of Mikheil Grushevski Public School 41 Anna-Maria Kartozia was awarded with a net book on behalf of Ms. Margarita Baski, the citizen of Ukraine. Today Minister of Education and Science of Georgia Giorgi Margvelashvili awarded up to 40 finalists of school competition dedicated to 150th anniversary of Ekvtime Takaishvili’s birthday with certificates and gift cards. Today, Giorgi Margvelashvili, Minister of Education and Science of Georgia held meeting with up to 200 students from state and private higher education institutions. Conference “Investment in the Future of Georgia – National Plan for Development and Life of Children” organized by UNICEF has been opened today. The Conference is attended by representatives of Parliament of Georgia, Government of Georgia, civil society and scientific circles Prime Minister Bidzina Ivanishvili opened the Conference. Elections os School Board - the highest self-government body in general education institution are due to be conducted on June 9, 2013. 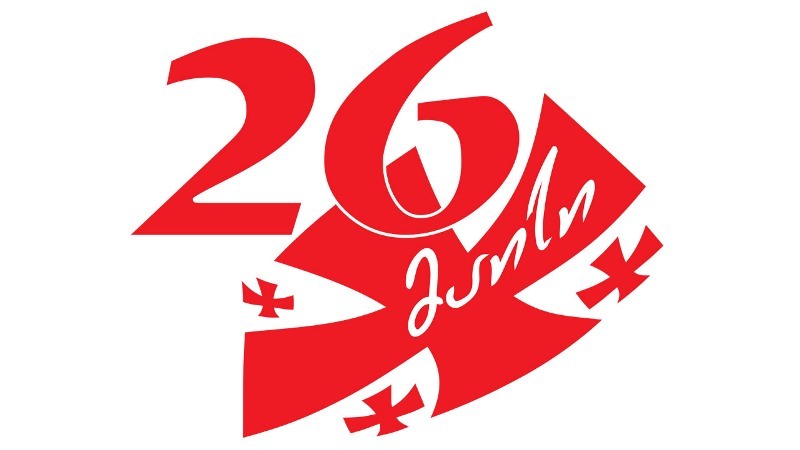 №2 Martkopi Public School celebrates its 250th anniversary with the project “St Anthony of Martkopi and 250 Years of Education in Martkopi”. Today, a number of events were organized within the Martkopi Public School Week. Memorandum of Understanding was signed within the framework of International School Project SPARE (School Project for Application of Resources and Energy). 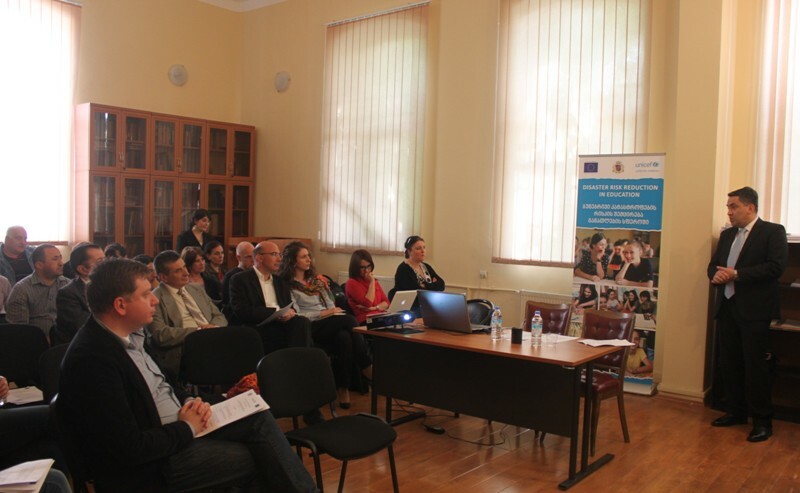 Norwegian architect and inclusive education experts are conducting seminars for Georgian specialists in June 3-7 within the framework of joint project between the Ministry of Education and Science of Georgia and the Ministry of Education and Research of Norway - “Implementing Inclusive Education in Vocational Education and Training System”. Today, Minister of Education and Science Giorgi Margvelashvili handed pectoral award “Amagdari” to Adil Sharifov, Principal of Sadakhlo №2 Public School. A round table was held within the framework of International Scientific Conference “Mood Psychology-implementation and development perspectives” Giorgi Margvelashvili, Minister of Education and Science participated in the work process of the Conference. Two exhibitions “Read and Write with Anne Frank” and “Anne Frank-Actual History” opened in Tbilisi Classic Gymnasium. The exhibition was opened by Davit Jamagidze, principal of Tbilisi Classic Gymnasium, First Lady of Georgia and UN Association of Georgia. According to the decision of the Ministry of Education and Science of Georgia, pupils shall have school textbooks free of charge for the school year 2013-2014. Printing is provided by “United Georgian Publishing House Favoriti Print and MVP”. 1.5 million textbooks have already been printed. Minister of Education and Science Giorgi Margvealshvili held a meeting with German guest Tassilo Schmitt, Professor of Bremen University (Ancient world history), Head of the Union of German Faculties of Philosophy. Giorgi Margvelashvili, Minister of Education and Science and Sozar Subari, Minister of Corrections and Legal Assistance visited №11 Special Establishment for Juveniles. Two ministers congratulated juveniles with Children’s Day and handed them books as presents. Ministers congratulated all children and their parents as well. With the initiative of Giorgi Margvelashvili, Minister of Education and Science of Georgia, pectoral award “Amagdari” was established for special merits in upbringing of future generations. 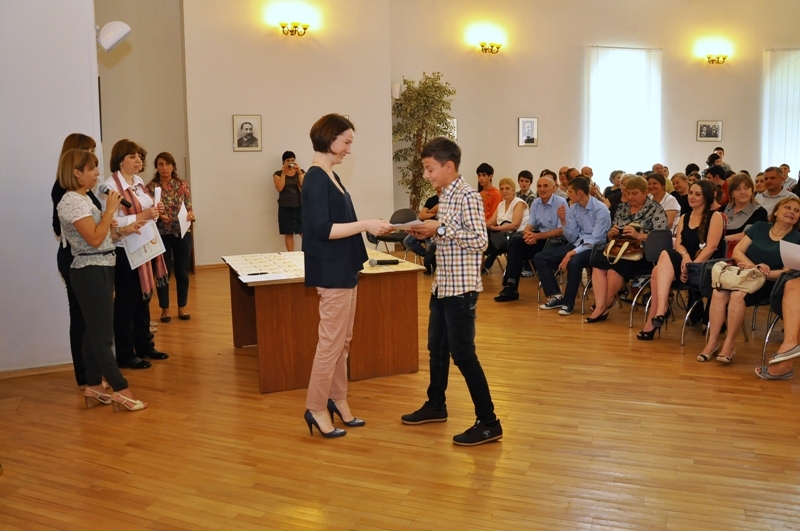 The first award was handed to Klara Potskhverashvili, Georgian Language teacher at Poki Armenian-language public school in Ninotsminda district. Organizational Staff of Unified National Exams was set up at the Ministry of Education and Science of Georgia in 2013. First work meeting of the Staff was held today, all content and logistics –related issues were discussed. Minister Margvelashvili opened the meeting. Minister of Education and Science of Georgia Giorgi Margvelashvili met with teachers and pupils of Lambalo public school in Sagarejo. Minister spoke about the decision to build a new school in the village. Teachers’ Professional Development Center has started registration for the program “Georgian Language for Future Success”. Director of the Center Gia Mamulashvili made a special statement regarding the issue. Modern-standard Vocational College “New Wave” celebrates its 50th anniversary. A number of events were held dedicated to the anniversary. Competitions in different vocations, master classes and conferences were organized within the framework of the event. In order to ensure life-long learning, the Ministry of Education and Science of Georgia is implementing educational program in penitentiary system. Within the Program, a memorandum was signed in April of the current year between the Ministry of Education and Science of Georgia and the Ministry of Corrections and Legal Assistance of Georgia. Minister of Education and Science of Georgia Giorgi Margvelashvili visited National Scientific Library of Tbilisi State University. Today, Ekvtime Takaishvili Rarity Hall was opened and a presentation on manuscript micro films electronic archive of National Scientific Library was made. Representatives of the Company “NOBL Georgia” handed up to 100 school desks to №2 Kareli Public School. Minister Margvelashvili visited the school and met teachers and pupils last month. During the meeting, Minister was informed on the lack of school desks. Within the framework of the activities of II compact “General Education Quality Enhancement Component” aimed at improving school infrastructure financed by MCA Georgia on May 14, 2013, a tender was announced on the purchase of consultation service for “Developing Public School Designs and Conducting Environment protection protection/social/gender related Research”. Basketball tournament final was held between the teams of 1Experimental School and 52 Georgian Cadet Public School within the framework of the Project initiated by the Ministry of Education and Science of Georgia aimed at popularization of sport among teenagers. Successful volunteer teachers of the program “Teach and Learn with Georgia” were handed Certificates. Two best teachers were awarded with Certificates of Appreciation and medals by Minister of Education and Science Giorgi Margvealshvili. Conference-exhibition of Civic Education Teachers’ Forum was held. Participants of the Forum, more than 300 teachers from all regions of Georgia and other guests were acquainted to the ongoing novelties in the field of Civic Education, received information from participating teachers about their experience and professional development. First inter-agency coordination meeting “Reduction of natural disaster risks the field of education” was held at the Ministry of Education and Science of Georgia on May 10. 2013. The meeting was organized by National Curriculum Department of the Ministry and UNICEF. The Ministry of Education and Science of Georgia awarded winners of Essay Competition. More than 100 pupils of Kakhi and Balakani participated in the competition. The ceremony was held in Culture House of village Alatemuri. Second stage final of a tennis competition was held among public schools on tennis courts of sports complex “Gio-Miri”. 64 pupils, winners of first stage subgroups played in the final. Head of Administration of the Ministry of Education and Science awarded the finalists with diplomas. 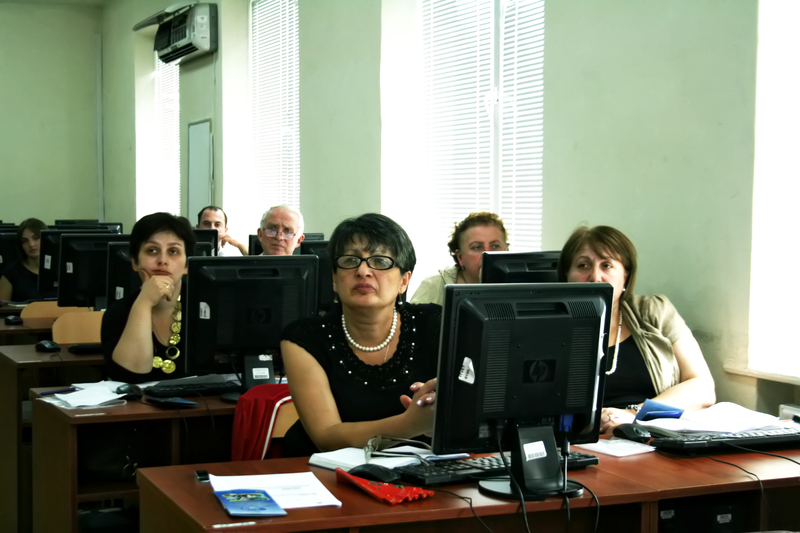 Fifth internet consultation was held within the framework of teachers’ contest “Partners in Education – Georgian Forum 2013”. Deputy Minister of Education and Science Aluda Goglichidze addressed the teachers.